• Function & identification of Electro-pneumatic components & their symbols. Controls with time delay, pressure sequence valves. 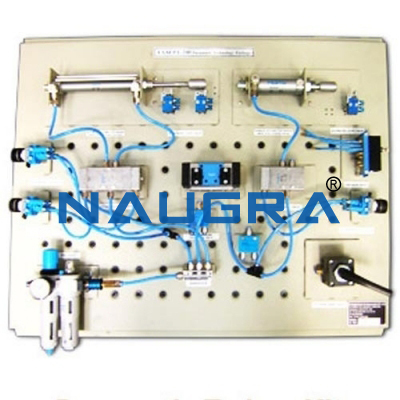 • Design & function of an electro-pneumatic System. • Logic AND/OR function to start signals. • Application and fault findings of Electro Pneumatic controls. • Pneumatic power section – Electric control section. • To empower students to design their own circuits. • The kit is modular and upgradeable. • Training Manuals provided for Operation with Ease. The components are capable of being mounted on an appropriate profile plate with grooves for secure and flexible positioning so that the components can be clamped firmly, quickly and safely through quick fix adaptors. Industrial components are used in the kit so that the students get hands on practical training in using industrial components. 1] Profile Plates & Stand: The anodized Aluminium profile plate is the basis for training. All components fit securely & safely onto the profile plate with safe fixing arrangement. Grid Dimensions: 50mm, Size: 1000 ×700mm. 5] Pressure Sequence Valve assembly: 1 No. :- The pressure of the control signal can be set by means of the pressure setting screw (variable). Design type is Poppet Valve with return spring. Operating Pressure range – (1.8 – 8 bar). Control Pressure range - (1 – 8 bar). 6] Single Acting Cylinder: 1 No. : Design type is Piston Cylinder. Operating Pressure 10 bar. Stroke length – Max. 100mm. 11] Signal Input, Electrical: 1 No. : The device contains an illuminated push-button switch (control switch) & two illuminated push buttons (momentary contact switches) with terminals and two buses for power supply. Contact set – 2 makes, 2 breaks, and Contact load – maximum 1A. 12] Indicator & Distributor Unit, electrical –: 1 No. : The device contains an acoustic indicator and four lamps with terminals and three buses for power supply. Through-contact socket pairs per lamp allow the element to also be used as a Distributor. 17] Pneumatic – Electric convertor:-1 No. 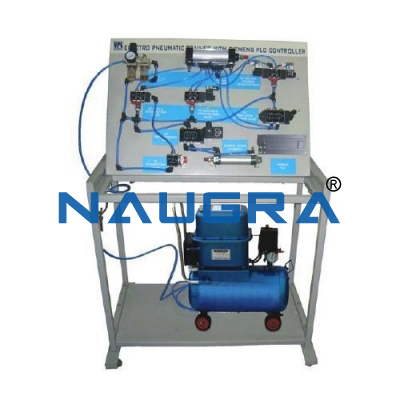 : The pneumatic – electric convertor can fulfil 3 functions: Pressure Switch, Vacuum Switch and Differential Pressure Switch. 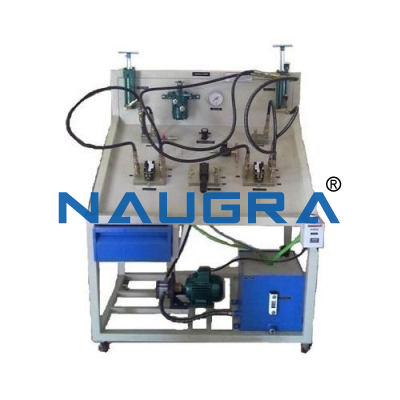 Pneumatic Technical Data: Pressure Ranges: Pressure Switch connector P1 - 0.25 – 3.5bar, Vacuum Switch- -0.2- -0.8 bar Differential Pressure Switch: Connectors P1….P2 - (-0.95 – 3.5 bar), Switching Current: - 400 mA. 20] Equipment Tray – 1 No. : MS powder coated tray with slots for placing components to be supplied with Electro-pneumatic supplementary kit. 22] Plug in adapter: For mounting components with plug-in foot on the aluminium profile plate. 23] Quick Push-Pull connectors: Sufficient shall be supplied for branching of the tubing for making of the circuitry. 24] Plastic Tubing: PUN 4×0.75, Exterior Diameter-6mm, Interior Diameter- 4mm, Transparent – 10mtrs, Blue-10mtrs. 1.5 Meter (2 core) ________________6 No. 1 Meter (3 core) _________________ 3 No. 300 mm Red: - 06 No. 300 mm Black: - 06 No. 230 V AC, 50 Hz Power Supply. Dry, Compressed, Clean Air supply at 4-5 Kg/Cm². Note: All descriptive matter and illustrations are intended to give only a general idea of the equipment. Detailed specifications may be altered at the company’s discretion without any notice. 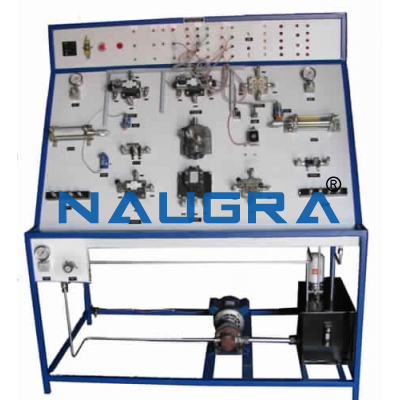 Other Related Teaching Lab Products, Scientific Instruments and Educational Equipments like ELECTRO-PNEUMATIC TRAINER KIT. . .